The Cyclades are a group of Greek islands in the Aegean Sea, south east of mainland Greece. Positioned between Athens and Crete, they are easily accessible and because of this and their quintessential Greek character they are the most popular. As you’d expect with a Greek region, ferries are one of the best modes of transport for travelling to or between the Cyclades. The mainland ports of Piraeus (Athens), Rafina and Lavrio connect you with the islands with most of the islands directly; Mykonos, Naxos, Paros, Santorini, Ios and Milos featuring the most frequent crossings. Though a lot of ferry travellers in Greece heading off to the Cyclades arrive as foot passengers, the major Islands have good roads and exploring them by car is a good option especially to reach the more remote beaches. Each of the Cyclades islands has its own characteristics and most are compact enough to explore within a few days. Consequently, they are ideal for those planning to spend their holiday island-hopping because of the great ferry links. Mykonos is one of the two most popular islands and is the one to head for if you want a high-energy nightlife centred on Mykonos Town. It is also home to fine beaches and is also a paradise for water sports such as surfing, windsurfing and sailing. If you are after quieter beaches, visiting the north of the island is recommended. 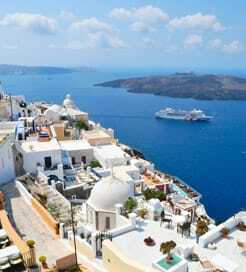 Santorini is the second most popular island and curves around a lagoon created by a still active volcano. The island’s villages are perched on spectacular cliffs overlooking the sea. Santorini, thought by some to be the site of Atlantis, is home to the ruins of the city of Akotiri, a mini Pompeii but much older. Ios attracts more under-25’s than any other Greek island, no doubt drawn by a relentlessly hectic nightlife. Close by is Naxos. Big, green and mountainous, the island has long sandy beaches, the ruins of a Byzantine castle and fortified Venetian mansions. Paros offers a far less dramatic landscape and is home to typical fishing villages, good beaches and lively nightlife. Milos, also formed by ancient volcanic activity, has spectacular caves which make for great snorkelling and diving. It has fine sandy beaches, hot springs, beautiful old churches, early Christian catacombs and the remains of a prehistoric settlement. On a lovely morning in early October I sailed to Paros. The ship was bigger than I expected and the voyage was comfortable and the sea was was very calm. Friendly staff, modern facilities, good selection of food and drink on board. We were impressed by the seamanship of the captain and crew. We left Piraeus on time and arrived at Thira on time. We are looking forward to using Blue Star again soon. "Santorini to Rhodes 7 October 2016"
We travlue Star 2 which seems to be very new and has good facilities throughout the ship. It leaves Thira conveniently at 00.50 and gets into Rhodes at 09.00. We had a two berth outside cabin. It was quiet and spotlessly clean with own bathroom. The beds were comfortable and we slept through til 07.30. Very worthwhile and I would do it again. There appears to be a very nice restuarant as well as the usual cafes and if I did this by day I think I would give it a try. The prices looked reasonable. I would recommend this ship and the cabin is well worth the extra cost. Travelled to Paros and back to Piraeus with blue star ferries. Most enjoyable experience. Booked stickers online. Staff at Piraeus very helpful, staff on the boat extremely polite and helpful. Ferry left dead on time on both accaisions. Well done blue star ferries! For more information, please visit our Ferries from Dodecanese Islands to Cyclades Islands page. For more information, please visit our Ferries from Aegean Islands to Cyclades Islands page. 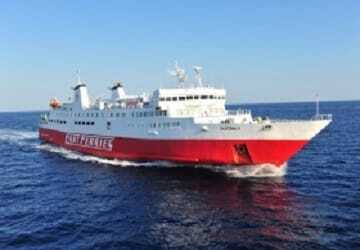 For more information, please visit our Ferries from Crete to Cyclades Islands page. For more information, please visit our Ferries from Samos to Cyclades Islands page. For more information, please visit our Ferries from Greece to Cyclades Islands page. For more information, please visit our Ferries from Athens to Cyclades Islands page. For more information, please visit our Ferries from Lesbos to Cyclades Islands page.